"Some of the most potent cancer drugs ever made include metals and other inorganic compounds." Chemist Tom O'Halloran is a world-renowned expert on inorganic compounds—metals, specifically—and how these compounds function in the body. He believes certain inorganic elements and compounds could be used more broadly to kill cancer. Like arsenic. Arsenic is known more for its use as a poison than as a cancer drug. Arsenic poisoning is said to have killed Napoleon Bonaparte and Simon Bolivar. And paradoxically, arsenic exposure is associated with an increased risk of cancer. Yet low doses of arsenic trioxide have shown a 95 percent remission rate in acute promyelocytic leukemia (APL), a type of blood cancer. Arsenic can shut down the growth of other cancers as well, O'Halloran says, but conventional arsenic delivery methods have not been successful in solid tumors in the breast, lung, ovaries and elsewhere. "What limits arsenic's broader application in cancer is its toxicity," O'Halloran says. "So, we asked whether we could control that toxicity but still allow its destructive effect to manifest only in cancer cells." To do this, O'Halloran and his team put insoluble particles of arsenic into a liposome, a tiny droplet of fat about one-hundredth the width of a human hair, creating what they called a "nanobin." These nanobins, when injected into the bloodstream, release arsenic only once they reach cancer cells. Healthy cells remain unscathed. But how? To understand how nanobins work, O'Halloran says, it's necessary to understand tumor biology. Cancer cells need to recruit a source of oxygen and nutrients in order to survive and grow. Through a process called angiogenesis, tumors send out signals that stimulate blood vessels to grow toward, in and around the tumor. Those new vessels, unlike others throughout the body, are leaky, with gaps and holes several hundred nanometers in diameter. 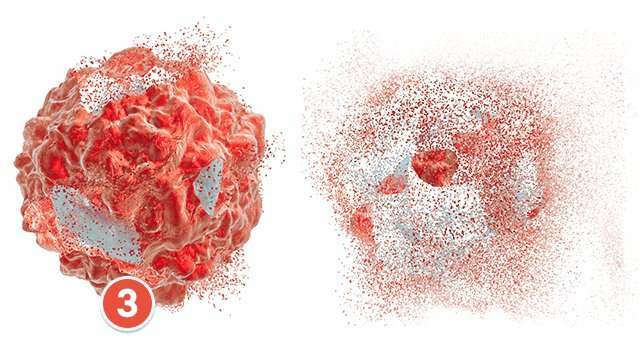 These new vessels don't leak red blood cells, which are too big to move through nanometer-sized holes, but nanobins can slip through the gaps to collect in the tumor. "The tumors start collecting the nanobins in ways that normal tissue doesn't, building up the concentration of these arsenic-loaded liposomes in the tumor," O'Halloran says. But once the nanobins collect in the tumor, how does the arsenic come out? Again, O'Halloran uses cancer biology to his advantage. Due to the way cancer cells process nutrients and make energy, they are slightly more acidic than normal cells. That acid helps dissolve the arsenic particles inside the nanobins, releasing the active drug inside the tumor. "The acidic character of the tumor helps it grow and proliferate, which is something we can take advantage of with nanobins," O'Halloran says. 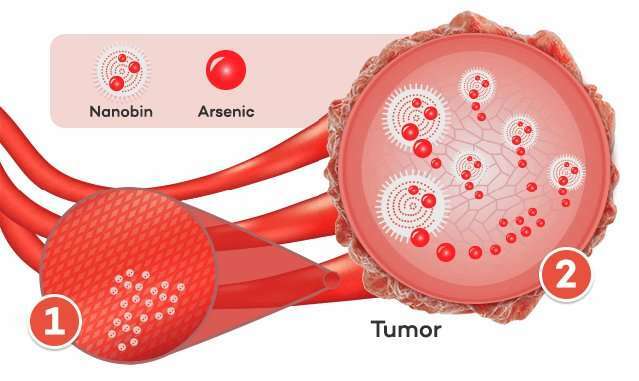 O'Halloran has found a way to exploit the unique features of tumors to smuggle arsenic directly into cancer cells: the leakiness of the newly created blood vessels helps nanobins collect in the tumor, and the acidic interior of the tumor coaxes the arsenic out. 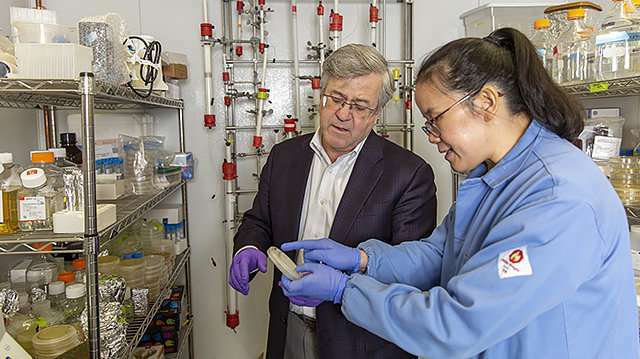 Working in collaboration with the Robert H. Lurie Comprehensive Cancer Center of Northwestern University, O'Halloran's team has shown in animal models that nanobin injections effectively kill breast, ovarian and lung cancer cells. O'Halloran and his collaborator Teresa K. Woodruff, chief of reproductive biology research at the Feinberg School of Medicine, showed that unlike other drug regimens, nanobin treatment is "ferto-protective," preserving fertility while killing cancer. "I think this is really critical for drug delivery and development," O'Halloran says. "In addition to fertility concerns, heart toxicities are common with cancer drugs, and we often don't deal with them until the late stages of drug discovery. Delivery mechanisms like nanobins could help protect healthy tissue from these and other harmful effects of cancer treatment." O'Halloran is now testing a way to track nanobins inside the body, attaching to their surface certain molecules that cancer needs to survive. These molecule "decorations" transform each nanobin into a Trojan horse, O'Halloran says. Cancer cells lure these decorated nanobins to their surface, eager to acquire the attached decorations. Then, the cancer cells "open the door and bring the lipid vessel—the whole kit and caboodle—into the cell," O'Halloran says. The results of this work have been striking. These decorated nanobins were able to cross the blood-brain barrier, release the arsenic and kill brain tumors that metastasized from the breast. Buoyed by these findings, and working with Northwestern Feinberg School of Medicine neurologist C. David James, O'Halloran now has his sights set on glioblastoma, a notoriously aggressive brain cancer with virtually no effective treatment. "It's abundantly clear that we need completely new methods to try to shut down cancer proliferation," O'Halloran says. "We're very excited that our work could pave the way for new types of treatments for brain, breast and other very resistant cancers."